This seemed to be the theme of Mikail's birthday party yesterday. 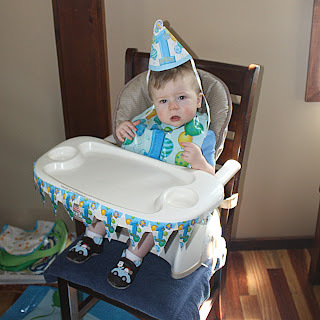 We think he's teething his molars right now, so he was not really into the party much at all. I made a mini cake for Mikail to demolish himself and then I made a cake in the shape of a number one and cupcake balloons as well. I am not a cake artist and never will be, but everyone loved it and that's all that matters, right? Even though he wasn't quite himself, he did land up having a great time once he warmed up to everyone a bit more. So glad we did this. So much to celebrate about from these past 12 months and so great to have a few people who supported us this past year to join in the celebrating. It's days like this that make us miss our families, but it's so nice to know that we have a small army behind us here that we can call family. Those cakes are so cute! I really need to up my cake making skills in time for Noah's first birthday in December, lol.